Modules used in overslung gimbal mode. Nostromo on speed rail vehicle mount. All Freefly gimbals. (With toad in hole). Fits virtually any body size. Minimal body contact points and large air flow. Replaces handles on DJI, Freefly and Tilta gilmbals, plus others with similar design. Allows pan and tilt through the camera's centre of gravity. Arri rosette mount for grips and extension grips. (In production version). Built in quick-release female socket. Spacial damper/ quick release module. Spacial damper dampens and isolates residual movement on all axis. Quick release utilises a one lever, dual lock mechanism. If the lever is accidentally released, the gimbal/ camera is still locked in place. Accepts fluid heads with a 100mm bowl. Attaches via module quick release to the Nostromo arm. 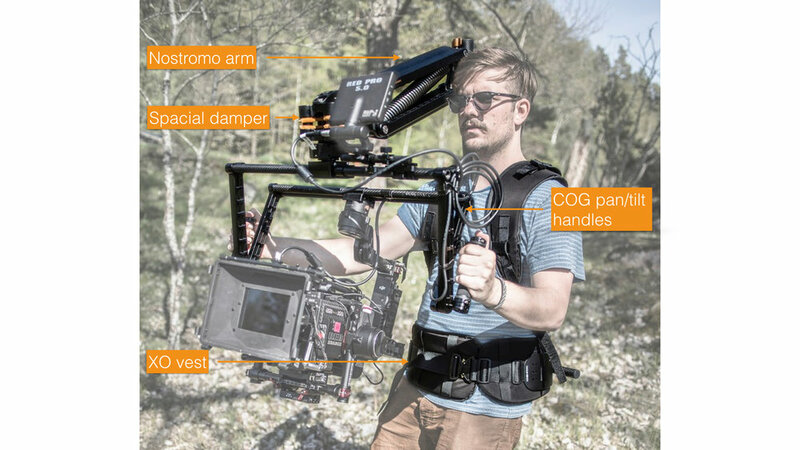 Allows for vertically stabilised hand held. Takes majority of weight when camera is lifted or pushed down. Camera stays in position when lifting or downward force is released. Attaches to XOvest main support rod.